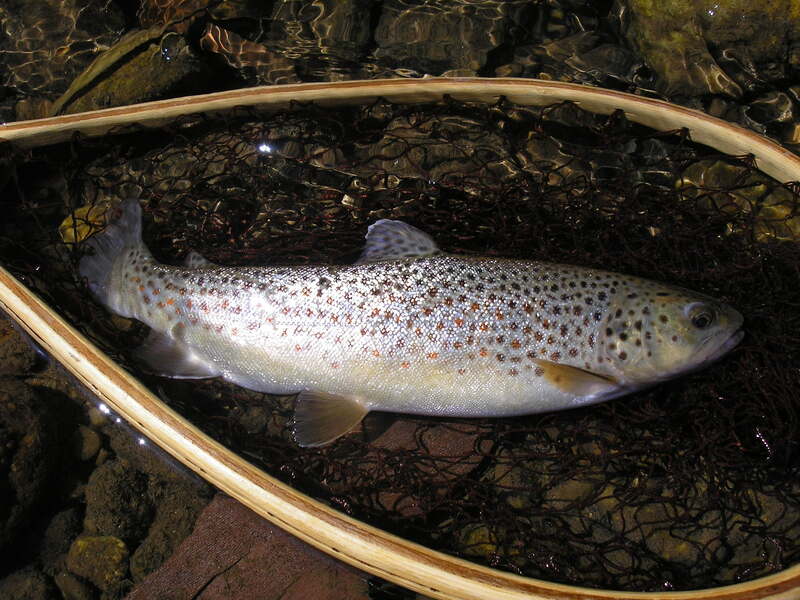 Many people think the best way to catch trout is with a fly rod…not so! I’ve caught hundreds of trout with my ultralight spinning outfit and, when casting in tight quarters, actually prefer it to my flyrod. More of us have spinning outfits than flyrods anyway. The biggest mistake that most people make… is using line that is too heavy. Couple that with large hooks and sinkers and you have the recipe for a nice day at the stream with no fish! 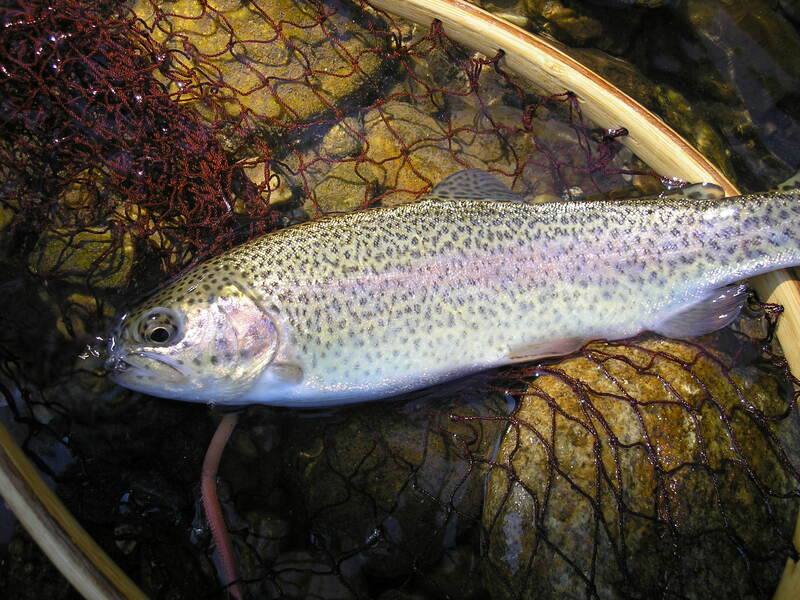 Trout prefer subtle presentations that drift at the speed of the current. They have great eyesight so anything too unnatural will be quickly dismissed. I tied a small #8 thin wire hook to 4lb. test line and added a micro split shot 8 inches up from there. After threading a 2 inch artificial trout worm on the hook, I finished the rig with a very small float to serve as a strike indicator. A pinch-on foam float works equally as well. After numerous drifts through the hole I caught my first good fish, a nice 9 inch brown trout came to the net, after a good fight which included several exciting jumps! I took a few quick photos and released it back to the stream. Fifteen minutes and lots of casts later a beautiful Rainbow Trout took my offering. Repetitive casts and adjusting the float and split shots is key for success. I moved upstream to the next hole and after 35 minutes I’d caught another nice rainbow and a brown trout. All in all I’d caught four trout, not bad for 2 hrs. of fishing. In addition to the trout, I caught at least 15 small 3 inch suckers, though not of much interest to me, young children would love to have caught them. The river is literally teaming with minnows; a good sign that indicates a healthy ecosystem. Funny thing is, I really hadn’t expected to catch much of anything. Harmon Field is only 4 minutes from my house. Isn’t it funny how we often don’t believe that anything nearby could be very good? We often miss the beauty right before our eyes. This day was a good reminder. Fishing is a passion of mine. My friends might even add the word obsession in there somewhere. I once read that if people focused on what was important in life, we’d have a shortage of fishing poles…I couldn’t agree more. Here are some tips to increase your fishing success. *Use light or ultralight spinning tackle. *Use size 8 or 10 thin wire hooks (10’s are smaller). *Use small split shots to keep your bait down. *The use of a small float (really small) will help you detect strikes. *Pick up some plastic trout worms (Berkley trout worms work great). *When in doubt, waxworms and small pieces of redworms will get the job done. So pack up the family this weekend and spend the day at your favorite stream or river. Whether you cookout, swim, fish or all the above, you’re sure to have a great time!